What is on your must-buy-luxury shopping list? Handbags, jewelry, watches? These days, extra space - a luxury not found in most apartments - through self storage is the new chic. The self-storage industry, which was first established in the United States in the late 1960s, has grown substantially throughout the world during the previous few years. It has been especially popular in regions such as Japan and Hong Kong, where land is limited and priced at astronomical figures. For those wishing to enjoy a long holiday without worrying about their new car in their community parking lot or have an organized living room, self storage allows them to simply sign a contract, pay, get the key to their own storage and pack their worries away. In this sense, self storage is not considered by industry insiders as a necessity but rather as a luxury. 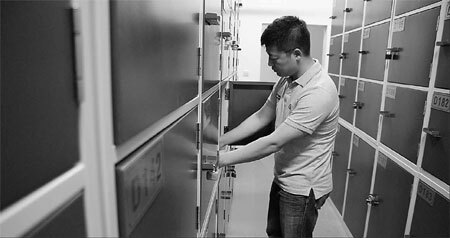 Easystorage in Shanghai has been in operation for about two years with seven locations. Luo Rong, a sales manager at the company, said: "Location is always the top priority. We are aiming to set up one branch in every district in Shanghai. But it is a luxury. The customer has to have enough money at his disposal to purchase the service. For average consumers or elderly people, they will never put their things here. "Our customers are mostly overseas returnees and well-off business people who have a better understanding of the benefits of self storage and the need for such services." But Chinese consumers are rapidly accepting the idea of self storage. At present, 10 percent of Easystorage's customers are foreigners, while the rest are Chinese born in the 1990s. Louis Hill, a representative of Drivers Jonas Deloitte, said: "The service is becoming increasingly popular as people get used to it. The main reason why people like self storage is because it is flexible, trustworthy and convenient. There's likely to be a great future for self storage in China as it gives lifestyle flexibility and convenience." For individual consumers, they mostly use small and medium-sized storages to keep files, such as financial documents and personal items, Luo said. Festivals also tend to bring in more business. Customers will store their personal belongings for two or three weeks while on vacation and retrieve them when they return, she added. "Self storage in Shanghai is growing so rapidly that we analyze the industry regularly. Our manager often goes to Shenzhen, Hong Kong and Japan to conduct market research. We are also planning to set up a branch in Beijing. Our expansion plan is focused on first-tier cities, where there are more wealthy consumers who need such a service," she said.